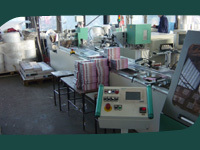 Our company has 15 years of professional experience in wrapping and bulk mailing preparation. 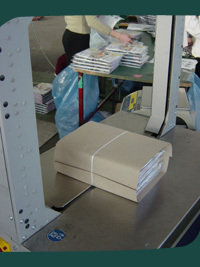 We are proud to be the largest preparer of bulk mailings in Hungary. No job is too big. Therefore you can expect from us the highest quality and most reliable service. Research proves that periodicals that are wrapped with foil sell better even without inserts. 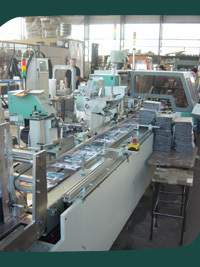 Our technology has the capacity to wrap sample products and other objects along with the printed products. Our capacity is 80-200,000 pieces per day depending on the complexity of the wrapping. In addition to sample products we also process inserts, bulk advertisements and nearly anything a customer needs to include. 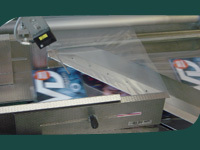 We also offer complete mailing service for your foil-wrapped products. Our service includes not only printing address stickers but also transport to the post office. We can do it all from beginning to end. 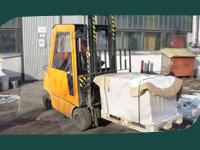 The accomplished products are prepared on pallets after the logistic adjustment, and we deliver them to the given address with our own vihacles.